Skintight suit with very specific contrasting panels. Poses and artists chosen to highlight her body. Pheromone powers that made her control dudes. Once upon a time, Spider-Woman was a Marvel Comics character that was seemingly tailor-made for ogling and creepy fantasies. She’s mad pregnant now, though. So, yeah, those days are over. When the longtime Avenger/secret agent got her own solo title last year, the first artist on it was Greg Land, a guy who’s infamous for drawing female characters who are absurdly sexed-up. That creative choice was representative of how she was treated for decades. But after Spider-Woman got de-tangled from the alternate reality Spider-Verse crossover several months ago, writer Dennis Hopeless took Spider-Woman in a new direction, complete with a new street-clothes look designed by Kris Anka. In this week’s Spider-Woman #1, Jessica Drew has a full-on belly bump and is sitting on the sidelines while other people beat up bad guys. 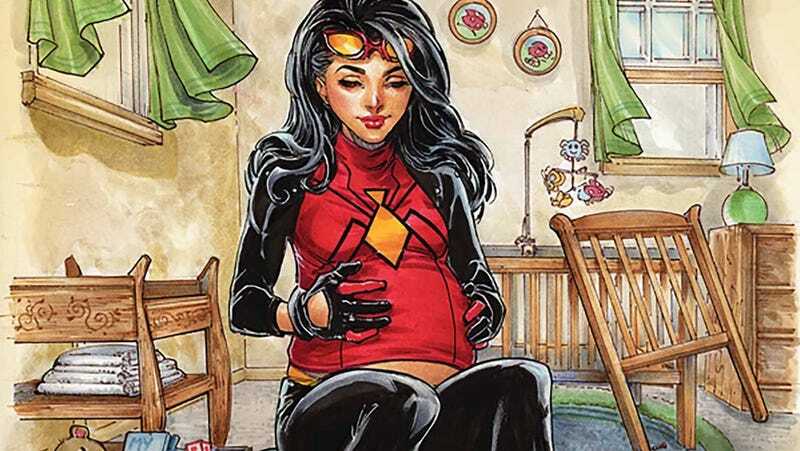 The pregnancy is a new plot twist, but this first issue follows up on the changes to the look and tone of the Spider-Woman title that started a while back. This is the next stage of a shift that saw Jessica Drew turn to down-to-earth private detective work after burning out on cosmic-scale world-saving. Her companions in issue #1 are still reformed supervillain Porcupine and Daily Bugle reporter Ben Urich but now Porcupine is the point man for Spider-Woman’s PI outfit. The once-bumbling C-lister has trained up well enough to bust heads on his own now, and Jessica’s about to go on maternity leave. Like the other titles in Marvel’s ongoing line-wide relaunch, Spider-Woman picks up after an eight-month gap. The events leading up Jessica’s pregnancy are still a mystery, especially since she hadn’t had a romantic interest in the series. Most of the issue is spent showing how poorly Jessica deals with the transition away from an action-filled crime-solving life. Hopeless gets a lot of comedic mileage from the new status quo. One great scene from the issue—set in a hero-filled maternity-leave party—has best friend Captain Marvel telling Iron Man that Spider-Woman is totally cool with telling people who the baby’s father is. Tony Stark finds out that isn’t exactly the case. And, while Jessica’s sworn off finding trouble, it doesn’t mean that trouble doesn’t find her. Spider-Woman’s become a much more interesting book since the creators moved her away from standard-issue superheroics. The previous volume’s best story arc focused on the terrible home lives suffered by women in relationships with supervillains. The beleaguered spouses and significant others took control of their lives with a funny, poignant scheme. Hopeless managed to deftly balance soul-searching pathos and snarky comedy in a way that’s become the series’ hallmark. Spider-Woman has been a best-kept-secret series in Marvel’s line-up, and the shift from pin-up to impending parenthood is a nice visual shorthand for just how much deeper the character feels when compared to previous iterations. Jessica Drew feels more like a super-everywoman now. That’s a rare thing for mainstream superhero comics to even attempt.